Note: Be sure to ask your Customer Success Representative about upgrading your community! 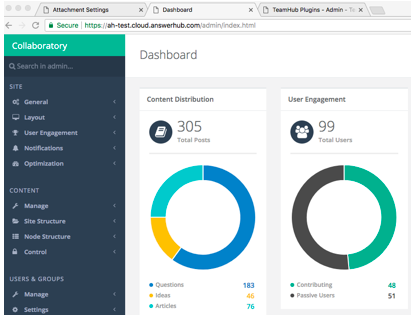 DZone is proud to announce the release of AnswerHub 1.8. For specifics on the customer upgrade process, click here. Hazelcast is an in-memory computing platform that AnswerHub is now leveraging for data distribution. By leveraging Hazelcast, AnswerHub takes advantage of in-memory caching to increase performance. The Froala editor will be the recommended replacement for our previous WMD editor. For more information on Froala, you can refer to their website. 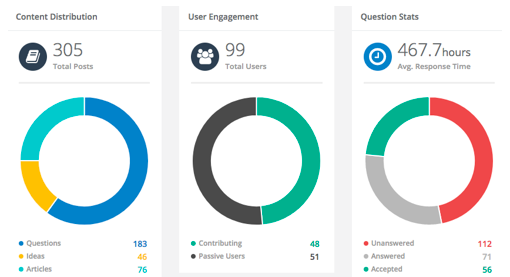 AnswerHub's analytics have been completely redone to be more performant with larger workloads, more insightful, and cleaner for faster analysis. AnswerHub's updated theme is modern and fresh. The themes perform faster and are more responsive. Our development team is working hard on the next big AnswerHub software release. In the meantime, we’re providing a patch release with over 60 improvements and fixes that will bring users a better experience. Before editing user information through the administrator panel or the front-end edit profile option would apply the requested change but then clear out any additional information that had previously been added by the user, for example, their 'About Me' details. Now, altering user information in all areas of the platform will result in only the specified fields to be updated. Generating a sitemap with our sitemap plugin now only displays content that anonymous users (site visitors that are not logged in) have permissions to view. Any content that an anonymous user is prevented from viewing in the standard community due to permissions is now excluded from the sitemap by default. Content results located in the 'Manage Content' section of the admin are now clickable providing a direct link back to any given post returned in your filtered results from the admin. There is a new configuration in our Shield plugin that will allow administrators to set a reputation-based threshold to exclude users with a defined number of reputation points from having their content indexed by the Shield filters. Previously, this caused some posts to be unintentionally sent to moderation queue if one or more of Shield plugin conditions were met. This new setting will improve spam management and manual moderation efforts. Admin users can now trigger the rebuild of the search index and determine the status of the rebuild with a PUT API. Before, re-indexing your search was only possible within the Administrator Panel. We now support the use of Alter-egos for KB-related actions through the use of our REST API. Both our Redactor and Markdown editors are improved in AnswerHub v1.6.6 with fixes to formatting, attachments settings, and commenting. Markdown and Redactor editors have also been updated to open a link in a new tab by default. Converting text to code now preserves line feeds and won't add additional line breaks within code blocks, allowing users to retain the integrity of their code with proper formatting. Features an enhanced toolbar, including additional formatting options and short-cut buttons, like embedded videos. In AnswerHub v1.6.6, we addressed several miscellaneous security issues. With all AnswerHub versions that we release, we improve our security measures to keep your community secure against the latest threats. 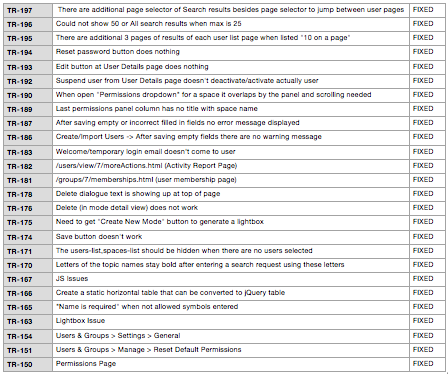 *Some configurations may need to be manually updated post v1.6.6 upgrade. Admin When the corresponding permission is revoked, the Users & Groups tab in the Admin is now hidden. Admin CSV and Excel file types to be are no longer rejected as an attachment for Articles as long as your node attachment settings are configured allow these files type. Admin The admin configuration to update content Plug upon edit now applies to questions in subspaces too. Admin An internal error is no longer shown when trying to open the Node Attachments Settings page for some users. Admin By default, the setting to "Change plug on username" (/admin/settings/user.html) is enabled, the UI now accurately reflects the default setting (enabled) that was already in place on the back-end. API When trying to update an Idea via REST API the "405 Method Not Allowed" error message is no longer given. API Follow a topic via REST API now respects the "EDIT_USERS_AND_GROUPS" permission instead of "MANAGE_USERS" permission settings, as it should. Core The "Bad request" pop-up is no longer shown after trying to make a question/idea/article site sticky. Core "Move content" prompt now given when deleting a space that only contains articles. Core A user will be redirected to the login page if they attempt to follow/unfollow a node and while also having the "Follow questions, users, topics, and categories" permission revoked. This no longer occurs. Editor The canComment() value is now properly returned in the Comment JSON instead of the canEdit() value that was previously returned.canEdit() value that was previously returned.canComment() value is now properly returned in the Comment JSON instead of the canEdit() value that was previously returned. Editor Comment attachment settings were increased for max files and size of files. Editor Attaching .avi files previously failed despite the file extension being included in the list of permitted node attachment file types. This now works as expected as long as the .avi file size is within your predefined maximum file size configuration settings for your various content types..avi files previously failed despite the file extension being included in the list of permitted node attachment file types. This now works as expected as long as the .avi file size is within your predefined maximum file size configuration settings for your various content types. Editor - Markdown Using 'enter' within code blocks will only insert one break <br> tag. Previously, this action would occasionally create 2 line breaks instead of 1 by inserting paragraph tags <p> instead of breaks <br> in the HTML. Editor - Markdown Converting text to appear within a code block was not preserving the individual lines of code. 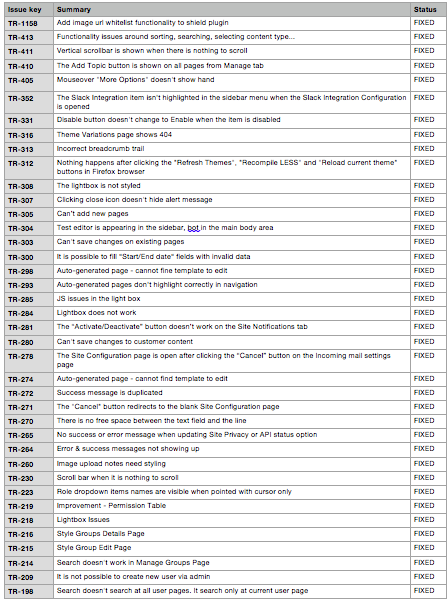 Instead, it was stripping out the HTML <p> tags rather than intuitively inserting "\n" as needed. Individual code lines are now preserved upon conversion from plain text to code blocks. Editor - Redactor The http protocol is no longer automatically added to the default sanitizations settings within the admin to result in link dialogs adding http:// in front of file links. Editor - Redactor The editor now accepts the use of asterisks for all node types. Editor - Redactor When trying to add a column to the right of a table, a column was previously added to left. It now works as expected. Editor – Markdown When using our Markdown editor, once a list format was implemented, ending the list with the addition of a line break followed by header text was ignored. As a result, the header-based text was not taking precedence over the list HTML format above. Now, the use of a header directly following a list will properly render upon saving. Gamification Scholar badge is now being rewarded to authors. Gamification The "Votes Left" counter widget properly updates on ideas without requiring a page refresh. Moderation In the admin, when viewing the 'Reported Content' within the Content tab, the default list sort options are now able to be applied. Moderation When using the 'Ask an Expert' functionality the user profile activity feed will now properly reflect this action. Moderation Moderators are no longer shown an incorrect activity record in the "Your Activity section" after rejecting an answer from the Moderation page. Node Improper object comparison could cause erroneous access denied messages. We have improved our method for object identification to prevent this error from occurring outside of the intended use cases. Nodes The required yes/no configuration for Question-based extended properties is now respected. Before, some of the field type options, like 'Date', were acting as if they were set to 'Required' even though the corresponding configuration was disabled. Nodes On rare occasions the predefined header and main navigation bar disappeared when viewing miscellaneous spaces/content types. This has been resolved site-wide. Permissions A "permission error" message is no longer shown while trying to cancel or change your vote for an idea comment as long as the "Vote up/down idea-comment" permission is granted. Reporting Internal error no longer appears after trying to enable/disable the Advanced Analytics Plugin. Reporting Karma (Reputation) report for specific spaces now works as expected. Reporting CSV export now includes a consistent number of columns and column names. Reporting "Last Seen" date now matches the last date shown on "Your Activity" within the admin user profile. Search/Filtering If a user selects the redirect option on a Question, but then cancels the redirect, any attempt to reselect the redirect would fail to return results. In v1.6.6 an attempt to redirect a Question will display consistently despite the number of cancellations within the same session. Search/Filtering In the 'Refine Your Search' options, if the 'Past Year' option was selected the UI would improperly reflect the 'Custom' time frame option instead. This has been resolved. Search/Filtering After performing a search, the number of results returned on each page is evenly distributed. Search/Filtering If a search is performed and then a custom date filter is applied in the 'Refine your Search' option, the list of content returned will now display the creation date. Search/Filtering Search returns "0 results" when specific variations of the search string are entered due to the query being run on the back-end even if the search appears to match existing nodes on the site. Security The Bad Words plugin filter now catches keywords found with dashes in a URL, such as -spamwords- or keywords after a slash such as http://spamwords. Site Custom web panels with the location "preMainContentPanel" are no longer shown twice. SSO AnswerHub will append a random number to the end of a username if that username is already in use, as it has in the past. SSO Previously, disabling the"Don’t Send SPNameQualifier.." option in Advanced settings of the SAML plugin was ignored. This configuration is now respected. Default node attachment settings: We have increased our default node attachment settings. If your team has already altered these your custom configurations will stay in place post-upgrade. If your community is still using the default settings from when your community was initially installed then these settings will update post-install to reflect our new default settings. Make Sticky/Make Site Sticky: The two sticky options are now pre-configured in our out-of-the-box installs. In the past, this functionality was available out-of-the-box but had to be manually configured in the admin post-install. Upon upgrading to v1.6.6 everyone will need to re-grant the Make Sticky and/or Make Site Sticky permission settings in order to continue leveraging this functionality. These permissions are now located in the Moderation category of permissions, instead of in the Custom roles category where they previously lived when manually setup.